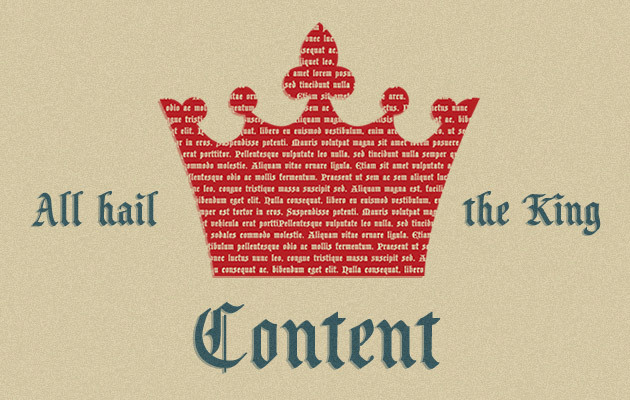 The phrase ‘Content is King’ has been pretty well used throughout search engine optimisation (SEO) articles and tutorials but it’s still a true statement when considering how your site’s content is written. Because ‘Content is King’, we provide content creation and consultancy services to our web design clients. Whether you love your modest brochure site, or you have a more substantial online presence, we can help you get the best out of your site’s content to make sure search engines love it too. At the end of the day, if you want people to find you for what you do (your keywords!) then you’ve got to include them in your website content. But you’ve got to use them properly! Having quality, relevant, useful, unique and different content is more important than ever. You need to make sure your content contains as many key words as possible, but is written in a grammatically and coherent format. You can’t just pack a paragraph full of key words; your content needs to be written in a certain style of language with a tone your audience wants to read. For example, we might want to tell you about the coding and technical wizardry of how we build websites to be responsive. Rather than writing about the code and programming language and being all ‘techy’ with it, we write about ‘Making your website respond so it looks beautiful on desktop, tablet and mobile devices’, because that’s what people what to read, what they will be searching for or simply what they’ll best understand. You want to make sure your content is engaging your audience. If it’s engaging them, then they’ll probably read more and in turn spend more time browsing your website, learning about what you do and how you could help them. Plus, the longer they stay on your site, and the more pages they visit, the more search engines like this, and in turn will help your site to rank better. Engagement doesn’t just stop at your audience’s time on your website. You want to make sure you’re giving people the opportunity to share your content. Social media links should be a must for any website. Not only is this something that search engines like, but you’re extending your reach to an even wider audience. Google and other search engines like ‘fresh’ content appearing on a website. We’re not talking about any old rubbish, or re-posting earlier blog posts (for example), but actually taking time to update your site with quality content. If you post something of quality and on-topic to your site, which is then viewed and shared by many people, search engines consider this a positive thing. Especially if this topic is something popular across the web on a wider scale – something industry or news related that others will be reading about from different sources. If people are reading posts on similar quality topics, then search engines figure that it must be a quality, relevant article. This can also help your ranking. There’s a skill involved in writing content that encompasses all of these techniques (and many more not mentioned in this post). We’re lucky to have welcomed Rhiannon to the Union Room team, with her role being dedicated to improving client website content via various SEO and content focused services. Maybe we can help you with your content creation? We’d love to speak with you about website content and how we might be able to help you develop a strategy for producing better content long-term. Content creation is not always something our clients have the resource to commit to internally – that’s where we can help. Why not give us a call to discuss further?